Pair them with any BR1 jacket for complete protection against the sea, spray, rain and wind. 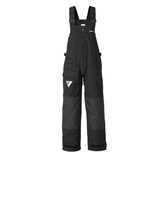 These waterproof trousers are constructed in durable, breathable fabric, the knees and seat are reinforced with abrasion resistant patches, and the knees are articulated for freedom of movement. Elasticated VELCRO® adjustable shoulder straps and elasticated underarms ensure a snug fit for complete comfort. These are the ideal hi-fits for offshore and day sailing.